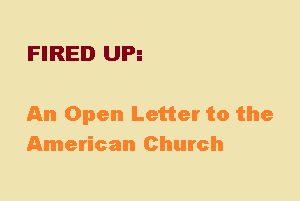 Christians 1, Jesus 0: An Open Letter to the American Church. Warning: This article will offend you but for that I do not apologize, for I believe now I understand how Paul felt when writing letters to the Corinthians. My grief, even coming from some of my own comments during the past week, is only surpassed by the greatness of the forgiveness of Christ and the Joy that comes with such forgiveness. Who are we church? Are we a group of people with individual voices? Or are we to be one voice? A positive change in a world that so desperately needs one? Which one are we to be? Did Christ tell us to make sure we got our opinions in and tell others how very wrong they are? Did the world come to our table only to find us fighting and argumentative. As I prepare to preach on 1 Timothy 2:1-7 I am increasingly aware and find myself constantly reminded how much we have forgotten the glorious mission we have been called to. Who has bewitched us, who has led us astray and turned our eyes off of Christ. For all of you celebrating the court’s decision concerning Hobby Lobby, that’s all well and good, it was a victory for traditional believers. But when someone lashes out at you and you lash back with some opinion that you perceive to be more correct than the person who attacked you are you any better than the world? I am guilty of it too, I know, I removed a post because of the fighting and argumentation and vain discussion going on. I do not want to be a party to division and I was. No one should desire that the flock be divided and no one should divide. Are we Cretan’s? Whose own poets called them Liars a fools. Does your opinion, if it is going to cause division, seem that important to you? Yes, maybe the Christians won, but Christ did not. I doubt even the owners of Hobby Lobby wanted the fighting that went on. They stood up for the rights of small businesses, that is true, they made their voice heard. But did they intend for Christians to start calling everyone names? I think not. The truth is that we have a great and glorious calling, we are to be a blessing, and if a blessing then a change in a world so desperate for one. Do the lessons of our forefathers mean anything to us? Israel and Judah were punished for their disobedience to the God who created them. Tyre was destroyed, as were Sodom and Gomorrah. We have become slaves to the god of opinions, one whose gospel is as divisive as the words themselves from the mouth of the saints. I do not care if you are Presbyterian, a Baptist, a Methodist, a Catholic or whatever you may be, I do not care. If the church is causing division and chaos then we are not fulfilling our glorious mission. We are far from making disciples, Christ is not winning, oh the Christians may be, and we may think that’s great, but Christ is not. If anything Christ has lost in this past week. Instead of a deep and abiding love we have shared hate, even with other Christians. You see we are to be LOVE to the world, we are to be PEACE to the world, we are to be HOPE to the world, we are to share FAITH with the world. Why? Because these are the things Christ shared with us, go read Romans, the entire book. Get out of the gospel of public opinion, withdraw your voice, surrender your right to speak. Lest we become the laughing stock of the world. You want to take back this nation for Christ? Bind yourselves once again to Christ our savior. Return to daily study of the word of God. Renew your commitment to this great calling that has been thrust upon us when we accepted grace and received Jesus as savior. Return to living a peaceful and quiet life, dignified in all ways, praying for all people, kings and rulers and those in authority. Remember the Piety of Hezekiah, the devotion of Josiah, the commitment of Daniel, the Faith of Christ, the life and testimony of Paul, the love shown by believers for centuries and the passion of the early church. Come back oh Church to the gospel of grace. To the eternal weight of glory given us by our salvation in Jesus Christ, recommit yourself to the gospel that brings life. We need to love again. We need to show grace again. We need to be a light again. Oh tasteless generation, come together and let us rediscover as one what we have lost. For we are the saints of a Holy God, we are the ones who believed, we are the saints and the chosen ones, the ones God has called free. It is time for reformation oh Church, it is truly time for awakening. Children 18:3’s New Album & The LGBT Community.